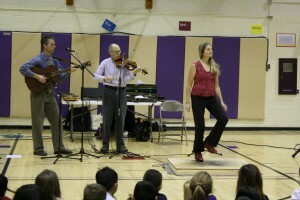 Fiddle ‘N’ Feet performed for Burkhart students this week, sharing their traditional music and percussive dance from North America. They played fiddle, banjo, guitar, and jaw harps and added clogging as a percussive dance element. The students enjoyed this unique music presentation.